“Wallace Point” is the property of land of 156 acres, shaped like a slice of pie, with a point on the Belmont Road and the crust running for ¾ of a mile along the tidal creek off the Avon River and along the south side of the Kennetcook River, where two rivers join opposite of Card Beach. The lane runs down the centre of this slice for ¾ of a mile from the Belmont Road to the house overlooking the rivers, and from which can be seen Mount Denson, Hantsport, Mitchener Point, Horton Bluff, Summerville Beach, Boot Island, and the land beyond and near Delhaven and Blomidon. In the late 18th and early 19th centuries, the farm was known as the “Point Farm”, but since at least 1847, when it was bought by John Wallace, it became known as “Wallace Point”. “Wallace Point” is the official name of the point of land used for hydrographic surveying, and is the name on the hydrographic chart (“Avon River and Approaches”) and on the geodetic and Topographical maps of Nova Scotia. Clearly the Aboriginal Peoples knew of this land, honouring it for its location and beauty; and likely used it for camping and setting of fishing weirs off the point, where salmon and other fish species were abundant. Some knowledgeable people believe there remain traces of Acadian settlement such as the foundations of a dam on the fresh water/tidal creek and a bridge to cross it. There are however no ‘dots’ to indicate a dwelling on the 1756 Acadian map of Minas Basin, showing the Acadian Villages on the shores of the Pisiquid River (see: John Duncanson’s “Newport, Nova Scotia A Rhode Island Township”, Plate V). Following the expulsion of the Acadians in 1755 and the arrival of the Planters starting with the first families in May 1760 in Newport Landing, and the eventful establishment of the separate Township of Newport, the forfeited Acadian lands were granted to the new settlers in various Crown Grants. “Wallace Point” is one of these parcels of land, known as letter A, Division 2, Number 4 of the Grant of 21 July 1761 and as shown on “A Town Plan of the Newport, N.S., by George Hallyburton, April 10, 1775). This land grant was made to Joseph Sanford, a young man whose family had arrived aboard the sloop “Sally” in May 1760. Apparently Joseph pined for his lady love back in Newport, Rhode Island, and did little with the land and soon after returned to his main interest in New England. The farm somehow became property of Christopher Allen of Rhode Island. Two of the original “proprietors” of Newport Township were Thomas Allen and James Mosher. Their families were linked by the marriage of Thomas’ sister Lydia Allen to James Mosher. With the following authority, Thomas Allen then sold the “Point Farm” to his nephew Jehu Mosher in 1797, by “power from my father Christopher Allen of North Kingston, Rhode Island”. (Interestingly enough, Allen reserved the right to the “Plaister of Paris in the bank by the river”). Thomas Allen became the MLA for Newport in 1806, one year after the Battle of Trafalgar. Jehu Mosher was a very good businessman and was also renowned for his unusual strength. It was said of him that for a wager he once carried a 900 pound anchor along a wharf. The anchor was raised to his shoulder and he walked with it for 30 feet. He said he did not breathe while the anchor was on his shoulder, and his feet burst through his thin shoes, which were new, but this was all the harm done. He gained the bet and lived to the age of 97. The land that Jehu Mosher owned and called the “Point Farm”, was added to, divided and sold over the years; but in the end, essentially remained intact. There are entries in the ‘Record of Hants County Deeds’ in various volumes showing transactions in 1814, 1816, 1827, 1828 and 1844, for various bits and pieces and their mortgages. These entries contain the familiar Newport Township names of Chambers, Mosher (Jehu, Daniel and Levinia), Greno, Miller, Blackburn and finally William Burgher. “Wallace Point” In 1847 William and Deborah sold “one half of the Point Farm”, to John Wallace, Yeoman, for 225 pounds. In 1854 John Wallace paid off the mortgage and acquired various lots of land and some dykeland. Since then, three generations of the Wallace family owned and lived at “Wallace Point” from 1847 until 1957 when the last Wallace, Thomas, a bachelor grandson of John Wallace and known to all as ‘Tommy’, died in the house in which he had been born on June 7 1882. The 1871 “Church” Map of Hants County shows the property and the current house marked “J. Wallace”. John Wallace (1810 – 6 March 1885) apparently known as “Happy Jack”, came to Nova Scotia from Ireland. His ancestral home is still extant in Mullinahaushin, Florence Court, County Fremanagh, Enniskillen, Northern Ireland. 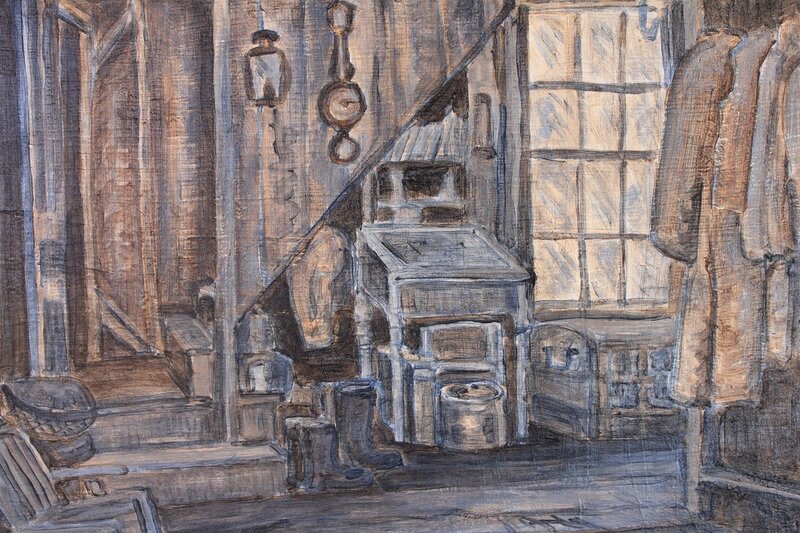 There is a picture of this house in the Museum archives and a letter to John from his brother Thomas in Northern Ireland in 1862. They had not seen each other in years and Thomas was happy to hear of his brother’s life and success, and to bring him up to date with all the family still in Ireland. There was a house on the property when John Wallace bought the farm in 1847. He and his wife Eliza (Ward) who died in 1897, lived in this house during the first year while they were building the current house at Wallace Point in 1848. This is the year their son William Bennett Wallace (29 April 1848 – 5 July 1934) was born in the new house. The stone foundation is made from the stone taken from the beach which has a large outcropping of rock, containing many fossils. Over the years geologists from a number of countries have come to study this rock formation. The first house subsequently became part of the farm buildings. John and Eliza had two children, William and Henry. Henry never married. The farm obviously prospered. Apart from mixed farming it eventually developed into a very successful apple and fruit farm. When their son William married Mary Abigail Nix (29 Nov 1854 – 23 Oct 1913) he built his own house (circa 1875) for his family at the end of the farm lane about 100 yards from the Belmont Road. This was apparently a substantial house in front of which was planted a fine stand of trees, a mixture of Chestnut, White Ash and Linden. These sixteen huge trees still line the left side of the lane. By 1970 only the sunken foundation and some of the beach foundation rock remained of this house. The reason is that in the next generation, one of William and Abigail’s sons, Thomas, the last Wallace to live at Wallace Point, did not want his brother, James, (who had been living in this house and had gone to the US for work) to return to the property. In James’s absence, the house was pulled down. When William’s father John died in 1885, William and his growing family (eventually eight children), moved back into the house in which he had been born in 1848 and where he died on 5 July 1934. A handsome obituary of William Wallace was published in the Windsor Tribune on 13 July 1934. “…he was one of the prominent farmers and orchardists of the district. Until a few years ago he had always taken an active part in the West Hants Exhibition, exhibiting as an Apiarist, attending the bees himself until his last illness… Mr. Wallace was born on the same farm where he spent his life, the greater part of it in the same house in which he first saw the light. In religion he was a Methodist and in politics a life long Conservative…”. William had built the farm into a very successful apple business. Prior to the cancellation, circa 1935, of the British Empire preference for the shipping apples to market in United Kingdom, schooners loaded with barrels of Wallace apples, sailed directly from the tidal creek at Wallace Point for England. Such was the reputation of his apples. Many of the zinc stencils for labelling the barrels are still extant and recall the names of apples long gone: Ribston, Rox Russet, Bishop Pippin, R.I. Greening, Jennett, Tompkins and Gravenstein. When William died in 1934 his son Thomas took over the farm and carried on mixed farming until his death in the house in 1957. The farm then passed to his sister Arabella Knowles (Church) who in turn gave it to her daughter-in-law, Muriel Church. 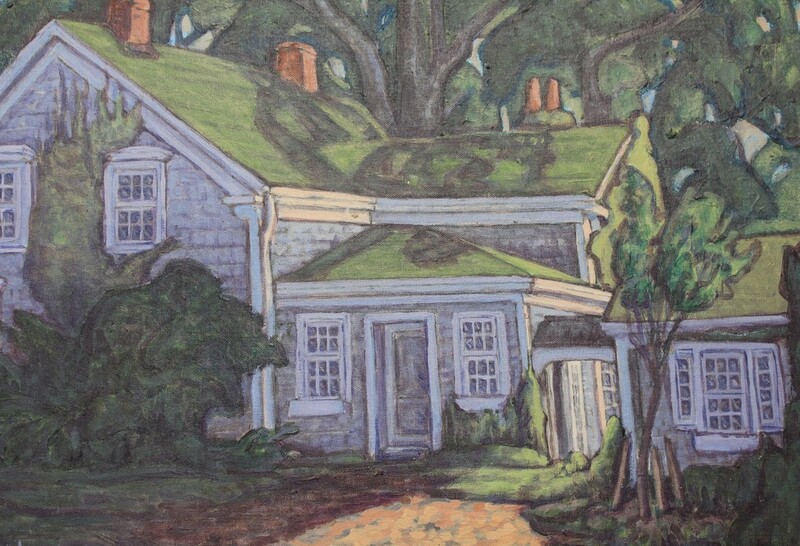 In August 1970, Wallace Point was sold by Muriel Church to Hugh and Alison MacNeil. The 1848 house had not been lived in since 1957, with the exception of occasional use by wood cutters and hunters. As we all have done as children, the house frequently was the sire for explorations by local youngsters, trying to discover the proverbial hidden pot of gold. Fortunately, although it was filled with bits of farm implements (bee boxes and bee keeping journals and a great deal of furniture that had not been sold in auctions in 1939 and 1945, and included the sole remaining beam from the long gone line of barns that ran down the edge of the lane, and was then used to ‘lock’ the front and back doors) the house was essentially open to the breezes. This probably saved the house and also made it attractive as a residence for a family of raccoons who scrambled up the outside and climbed in an opening under the eves to live in the attic and in the old trunks stored in the bedroom of William Wallace above the summer kitchen. A lean-to lead from the back door into the “applehouse” where the apples had been stored in wooden barrels. From there one entered the very comfortable three position ‘out-house’. In 1971 the applehouse was towed to the point and made it a rustic cottage. In the house, the plumbing consisted of a brick cistern in the basement, with a hand pump at the zinc sink above in the summer kitchen. Cooking was done on the lovely “Queen” iron woodstove made in Sackville NB. There were three shallow rock wells. Rain water was collected in the cistern. Heating was provided by a wood furnace with a grill in the floor in the central room of the house. This was the principal activity room for the large family of William and Abigail and in which Saturday night dances were often held with their neighbors and friends. The five main other rooms in the house had originally been fitted with either coal grates or iron wood stoves. Light came from candles, and coal oil lamps. Starting in the Spring of 1971, George Reynolds and his brother Cyrus, working for about three years, restored the house, built some additions and a pony barn. Without their skill, knowledge and innovative and wise ideas, the job could never have been done. Although the land had been in existence for close to two hundred years it had to be rebuilt to take modern vehicles. This meant two weeks with a bulldozer in the summer of 1971, the installation of six culverts to deal with the streams crossing the lane, and the Grove. Gordon Knowles and Volney Withrow installed the wiring in the house in the dead of the 1971 winter. The house need plumbing, bathrooms, a furnace, heating and septic systems, the creating of a substantial cistern, concrete footings by the rock foundations walls, drainage tiles, a concrete basement floor and a new roof. Fortunately all this was accomplished and Wallace Point remains a beautiful property, with its significant history and positive future. Some of the above information came from the public Archives of NS in Halifax. The Archives of the Avon River Heritage Society Museum contain many papers, pictures and documents related to Wallace Point and which have kindly been made available from Wallace family members and relatives, and from the owners of the 1799 Church house on the Belmont Road. Some of the papers were found in the chimney piece of that restored house. One of the most interesting documents is the deed of the water lot from the ‘Crown’ to John Wallace, purchased on 23 July 1857, complete with the official seal, on “VR” paper and with a water colour sketch drawn to scale describing the water lot. Many of these pictures and papers, and much of the Wallace family information were kindly supplied by Fred (and Alice) Wallace. Fred is also the nephew of Tommy Wallace for whom he worked on the farm at times in the 1930’s, before going off to fight as a soldier in WWII, and take part in the liberation of Holland. The Wallace Family tombstones are in the Belmont and Newport Landing cemeteries. « Wallace Point » est la propriété de terre de 156 hectares, formé comme une tranche de tarte, avec un point sur le Route Belmont et la croûte s’étendue ¾ d’un mile le long d’estuaire près de la Rivière Avon et le long de la côté sud de la Rivière Kennetcook, où deux rivières se joignent opposé de la Plage Card. 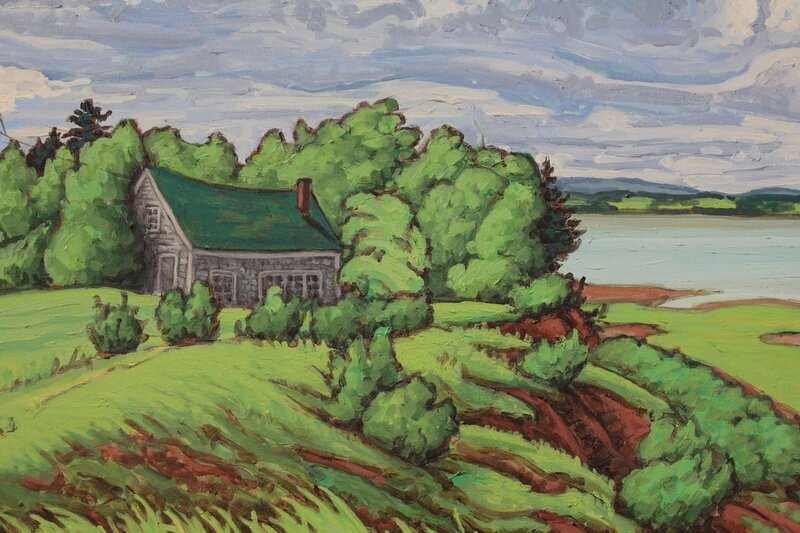 La ruelle va le long du centre de cette tranche pour ¾ d’un mile de la Route Belmont à la maison surplombant les rivières, et de lequel peut être vu Mount Denson, Hantsport, Mitchener Point, Horton Bluff, Plage de Summerville, île de Boot, et la terre après et proche à Delhaven et Blomidon. Pendant le 18eme siècle tard et le 19eme siècle tôt, la ferme était connue comme le « Point Ferme » mais depuis au moins 1847, quand elle était achetée par John Wallace, elle devient connue comme « Wallace Point ». « Wallace Point » est le nom officiel de la point de terre utilisée pour l’arpentage hydrographique, et c’est sa nom sur le graphique hydrographique (« Rivière Avon et Approches ») et sur les cartes géodésique et topographique de la Nouvelle-Écosse. Clairement les Personnes Aborigène ont connu de cette terre, l’honorant pour sa location et beauté; et probablement l’utilisé pour le camping et pour installer les barrages de pêche de le point, où le saumon et les autres espèces de poisson étaient abondant. Quelques personnes instruites croient qu’il reste les traces des colonies Acadiens come les fondations d’un barrage sur le ruisseau de l’eau frais/estuaire et un pont pour le traverser. Il y a cependant aucun « points » qui indiquent une habitation sur le 1756 carte Acadien de la Minas Basin, montrant les villages Acadiens sur les rivages de la Rivière Pisiquid (Voir : John Duncanson’s « Newport, Nova Scotia A Rhode Island Township », Plate V). Suivant l’expulsion des Acadiens en 1755 et l’arrivée des Planters commençant avec les premières familles en mai 1760 dans Newport Landing, et l’établissement riche en évènements de la commune séparé de Newport, les terres Acadiens perdus étaient données aux nouveaux colons dans plusieurs concessions. « Wallace Point » est un de ces paquets de terre, connu comme lettre A, Division 2, Numéro 4 de la concession de juillet 21 1761 et comme montré sur « A Town Plan of the Newport, N.S., par George Hallyburton, avril 10, 1775). Cette concession de terre était faite à Joseph Sanford, un jeune homme dont son famille avait arrivé à bord le sloop « Sally » en mai 1760. Apparemment Joseph était en deuil pour son amour à Newport, île de Rhode, et a fait peu avec la terre et juste après retournait à son centre d’intérêt en la Nouvelle-Angleterre. La ferme une main ou une autre devient la propriété de Christopher Allen d’île de Rhode. Deux des propriétaires originaux de la commune de Newport étaient Thomas Allen et James Mosher. Leurs familles étaient liées par le mariage de la sœur de Thomas Lydia Allen à James Mosher. Avec l’autorité suivant, Thomas Allen a vendu le « Point Ferme » à son neveu Jehu Mosher en 1797, par « le pouvoir de mon père Christopher Allen de Kingston du Nord, île de Rhode ». (De façon intéressante, Allen a réservé le droit de le « Plaister de Paris dans la banque près de la rivière »). Thomas Allen a devient le MLA pour Newport en 1806, une année après la bataille de Trafalgar. Jehu Mosher était un très bien homme d’affaires et était aussi connu pour son force inhabituel. Il était dit de lui que pour un pari il a un fois porté une ancre de 900 livres le long d’un quai. L’ancre était surélevé à son épaule et il a marché l’avec pour 30 pieds. Il a dit qu’il ne respirait pas quand l’ancre était sur son épaule, et ses pieds ont éclatés à travers ses chausseurs fins, qui étaient nouveaux, mais c’était tous les dommages faire. Il a gagné l’enjeu et a vécu à l’âge de 97. La terre que Jehu Mosher a possédé et appelé le « Pointe Ferme » était ajouté, divisé, et vendu au fil des ans; mais finalement, essentiellement a resté intact. Il y a des entrées dans le « Record of Hants County Deeds » en plusieurs volumes montrant les transactions en 1814, 1816, 1827, 1828 et 1844 pour plusieurs morceaux et miettes et pour leurs prêts immobiliers. Ces entrées contient les noms familiers de la Commune de Newport des Chambers, Mosher (Jehu, Daniel et Levinia), Greno, Miller, Blackburn et finalement William Burgher. « Wallace Point » en 1847 William et Deborah a vendu « un demi » de le « Point Ferme », à John Wallace, Yeoman, pour 225 livres. En 1854 John Wallace a acquitté son prêt immobilier et a acquis plusieurs parcelles de terre et quelques terres de digues. Depuis ce moment, trois générations de la famille Wallace ont possédé et vécu à « Wallace Point » de 1847 jusqu’à 1957 quand la dernier Wallace, Thomas, un célibataire petit-fils de John Wallace et connu de tous comme « Tommy » est mort dans la maison de qui il été né le juin 7 1882. La carte de 1871 d’« Église » de Hants County montrait la propriété et les maisons actuelles marquées « J. Wallace ». John Wallace (1810-6 mars 1885) apparemment connu comme « Happy Jack » a venu à la Nouvelle-Écosse d’Irlande. Son maison ancestrale est encore existante en Mullinahaushin, Florence Court, County Fremanagh, Enniskillen, Irlande de Nord. Il y a une photographie de cette maison dans les archives du musée et une lettre à John de son frère Thomas en Irlande du Nord en 1862. Ils n’avaient pas se vu l’un l’autre en des ans et Thomas était heureux d’écoutait de la vie et succès de son frère, et pour lui amener au courant avec tous la famille encore en Irlande. Il y avait une maison sur la propriété quand John Wallace a acheté la ferme en 1847. Il et son épouse Eliza (Ward) qui est mort en 1897, ont vécu dans cette maison pendant les premières années pendant qu’ils construisaient la maison actuel à Wallace Point en 1848. Ceci est l’année que leur fils William Bennett Wallace (29 avril 1848 – 5 juillet 1934) était né dans la nouvelle maison. La fondation en pierre est faite de la pierre pris de la plage qui a un affleurement grand, contenant de plusieurs fossiles. Au fil des années les géologues d’un nombre de pays sont venus pour étudier cette formation rocheuse. La première maison par la suite devient partie des bâtiments de ferme. John et Eliza avaient deux enfants, William et Henry. Henry jamais mariait. Le ferme évidement a prospéré. À part de l’agriculture mélangé il a finalement développé à un très brillant ferme de pomme et fruit. Quand leur fils William a marié Mary Abigail Nix (29 novembre 1854 – 23 octobre 1913) il a construit son propre maison (vers 1875) pour son famille à la fin de la ruelle de la ferme environ 100 yards de la Route Belmont. Ceci était apparemment une maison considérable devant laquelle étaient planté un bien stand d’arbres, un mélange de marronnier, frêne blanc et tilleul. Ces seize arbres énormes encore rangé le côté gauche de la ruelle. Par 1970 seulement la fondation en contrebas et un peu de la fondation rocheuse de plage restent de cette maison. La raison et que dans la prochaine génération, un des fils de William et Abigail, Thomas, la dernier Wallace de vivre à Wallace Point, ne voulait pas son frère, James, (qui a vécu dans cette maison et a allé à les États-Unis pour travailler) de retourner à la propriété. Pendant l’absence de James, la maison était détruite. Quand le père de William John est mort en 1885, William et son famille croissant (éventuellement huit enfants), ont déménagé à la maison qu’il était né dedans en 1848 et où il est mort en le 5 juillet 1934. Une nécrologie coquette de William Wallace était publiée dans la Windsor Tribune le 13 juillet 1934. « …Il était un des fermiers et orchardiste célèbre de le quartier. Jusqu’aux quelques années dans le passé il avait toujours pris un parti actif dans le West Hants Exhibition, exposant comme un apiculteur, gardant les abeilles lui-même jusqu’à son dernier maladie… M. Wallace était né sur la même ferme où il a passé son vie, la plus grand parti dans la même maison où il a premièrement vu la lumière. En religion il était un méthodiste et dans les politiques un conservateur à vie… ». William a construit la ferme à un brillant entreprise de pommes. Avant de l’annulation, vers 1935, de la préférence de l’Empire Britannique pour expédier les pommes au marché dans le Royaume-Uni, goélettes chargé avec les tonneaux de pommes de Wallace, ont navigué directement d’estuaire à Wallace Point pour Angleterre. Tel que la réputation de ces pommes. Plusieurs des stencils en zinc pour étiqueter les tonneaux sont encore existants et ont les noms des pommes révolues: Ribston, Rox Russet, Bishop Pippin, R.I. Greening, Jennett, Tompkins et Gravenstein. Quand William est mort en 1934 son fils Thomas a pris le contrôle de la ferme et a continué en agriculture mixte jusqu’au son mort dans la maison en 1957. La ferme était ensuite passé à son sœur Arabella Knowles (Church) qui un par un le donnait à sa belle-fille, Muriel Church. En août 1970, Wallace Point était vendu par Muriel Church à Hugh et Alison MacNeil. La maison de 1848 n’était pas vécue dedans depuis 1957, avec l’exception de l’usage occasionnel par les bûcherons et chasseurs. Comme nous avons tous fait comme enfants, la maison était fréquemment le site pour les explorations par des jeunes locaux, essayant à découvrir le proverbial pot d’or. Heureusement, bien que elle était rempli avec des morceaux d’outils de ferme (boites d’abeille et journaux d’apiculture et de nombreux meubles qui n’était pas vendu dans les ventes aux enchères en 1939 et 1945, et inclus la seule restant poutre de la ligne des granges révolues qui vont le long du bord de la ruelle, et était ensuite utilisé pour « fermer à clé » les portes d’entrée et de service) la maison était essentiellement ouvert aux brises. Ceci a probablement sauvé la maison et aussi la fait joli comme une résidence pour une famille de raton laveurs qui ont gravi en haut l’extérieur et ont monté dans une ouverture sous les avant-toits pour vivre dans le grenier et dans les vieux malles emmagasiné dans le chambre de William Wallace au-dessus le cuisine d’été. Un appentis allait de la porte de service à la « maison de pomme » où les pommes étaient emmagasinées dans les tonneaux en bois. Partir de là on entrait la très confortable toilette extérieurs de trois positions. En 1971 la maison de pomme était tractée au point et le faite une petite maison rustique. Dans la maison, la plomberie a consistée d’une citerne en brique dans le sous-sol, avec une pompe à main au lavabo en zinc au-dessus dans la cuisine d’été. La cuisson était faite sur le « Queen » poêle à bois en fer joli fait en Sackville NB. Il y avait trois puits en roche peu profonds. L’eau de pluie était collectionnée dans la citerne, Le chaleur était fournie par un fourneau de bois avec un gril dans le parterre dans la pièce centrale de la maison. Ceci était la pièce d’activité principale pour la famille grande de William et Abigail et de laquelle les danses de nuits de samedi étaient souvent organisées avec leurs voisins et amis. Les cinq autres pièces principales dans la maison entaient à l’origine eu soit les grilles de charbon soit les poêle à bois en fer. La lumière vient des bougies et lampes à l’huile du charbon. Commençant dans les printemps de 1971, George Reynolds et son frère Cyrus, travaillant pour environ trois ans, ont restauré la maison, construit quelques additions et une grange de poney. Sans leurs dons, connaissance et idées novatrices et sages, le travail ne pourrait jamais compléter. Bien que la terre ne fût pas en existence pour proche à deux cent ans elle avait besoin d’être reconstruit pour prendre les véhicules moderne. Ce signifie deux semaines avec un bulldozer dans l’été de 1971, l’installation de six caniveaux pour s’occuper de les ruisseaux traversant la ruelle, et le bosquet. Gordon Knowles et Volney Withrow ont installé les fils dans la maison en pleine d’hiver de 1971. La maison avait besoin la plomberie, les salles de bains, un fourneau, le chauffage et un système septique, le créant d’une citerne considérable, les bases en béton à côté des murs en fondations de pierre, les carreaux de drainage, un parterre de sous-sol en béton avec une nouvelle toiture. Heureusement tous de ceci étaient accompli et Wallace Point reste comme une belle propriété, avec son histoire significatif et futur positif. Certains de l’information au-dessus vient des archives publiques de NE en Halifax. Les archives de l’Avon River Heritage Society Museum contiennent plusieurs papiers, photographies et documents relié à Wallace Point et qui étaient gentiment fait disponible des membres de la famille Wallace et des propriétaires de l’église de 1799 sur le Route Belmont. Certains de ces papiers étaient trouvés dans le manteau de cheminée de la maison restaurée. Un des documents le plus intéressant est l’acte notarié de la parcelle d’eau de la « Crown » à John Wallace, acheté le juillet 23 1857, complète avec le sceau officiel, sur le papier VR et avec un croquis en aquarelle dessiné à l’échelle qui décrit la parcelle d’eau. Plusieurs de ces images et papiers, et beaucoup de l’information de la famille Wallace étaient gentiment muni par Fred (et Alice) Wallace. Fred et aussi le neveu de Tommy Wallace et pur qui il a travaillé sur la ferme de temps en temps dans les 1930’s, avant d’allant pour battre comme un soldat en la Seconde Guerre mondiale, et prendre parti dans la libération d’Hollande. Les pierres tombales de la Famille Wallace sont en les cimetières de Belmont et Newport Landing.